Middle school is tough enough for normal humans, but when you’re a vampire, it’s even more challenging. Edgar Stoker uses wit and humor to navigate the social complexities of middle-school and vampire culture. From surviving Saturday Vampire Jamborees to school lunches, Edgar tries to win friends in both worlds, but when he’s faced with angry vegetable-eaters, his troubles have just begun. Blood Diaries: Tales of a 6th Grade Vampire by Marissa Moss is an entertaining look at the life of one Edgar Stoker – 6th grade vampire. Despite Edgar being a vampire, he has many of the same experiences in school that a regular 6th grader would have, making the book fairly easy to relate to. Edgar writes in his diary about the history of vampires, some of the “rules” of being a vampire (like garlic, stakes, sunlight and telling others), what it’s like at his elementary school (friends and bullies) and the Saturday Vampire Jamboree where he has to deal with all his relatives. Marissa Moss does a very good job of making Edgar and his life believable. The problems in gets himself into and Edgar’s solutions for getting out of those problems are engaging and even a bit funny at times. 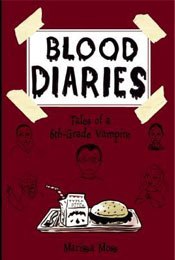 I think my only issue with Blood Diaries: Tales of a 6th Grade Vampire would be the amount of time spent describing each cousin, each friend at school, and all the little nuances of being a vampire. Since in this case Edgar’s diary is being written for an audience and not just himself it’s a bit understandable. Over all, though, I think this book series (I hope it will be a series) will find good homes on shelves of younger kids who enjoy the supernatural. Hardcover provided by JKSCommunications in exchange for my honest review. Thank you! Twig and Ben are unicorn riders – guardians whose job it is to keep the last free unicorn herd safe. But a new danger is threatening the beautiful, mysterious creatures of Lonehorn Island. A thief from Terracornus has snuck onto the misty island and stolen Ben’s loyal unicorn, Indy. There’s only one path for Ben and Twig – straight into the secret, shadowy heart of the island and through the passage to Terracornus. But their rescue mission is unexpectedly complicated by a secret Ben has been hiding. A secret about the Queen of Terracornus who has enslaved all the unicorns of Ben’s homeland. A secret that could save them all – or start a war. Book two in the Unicorns in the Mist series by R.R. Russell, The Unicorn Thief picks up where Wonder Light left off and brings the reader immediately into the current conflict – a thief is stealing unicorns from the castle in Westland in Terracornus. I quite enjoyed The Unicorn Thief and feel it’s a strong second book. While it continues and expands the main plot line found in book one – Twig becoming a unicorn rider and the need for her and Ben to start taming the free herd on Lonehorn Island – it also introduces us to new characters in Westland and a larger story-arc involving Ben and his former home. Unicorns are being stolen, war is coming to Terracornus and Lonehorn Island and the herd is being affected despite being a world away. When Ben’s unicorn Indy goes missing, Ben and Twig venture to Terracornus where they encounter a dungeon, a thief, a Boy King and a secret that Ben has been hiding. There are some wonderful action sequences, some soft family scenes and heartwarming moments between the unicorns and their riders. The Unicorn Thief by R.R. Russell builds nicely upon its proceeding book Wonder Light and sets up some great potential plot for future books. It’s a shorter book, sitting at only 200 and some-odd pages, and though I did enjoy it I found some parts felt a bit rushed. At one point, Ben receives a letter stating that something he needs to do will take place in six weeks. Those six weeks are covered in about two pages. Yes, we can’t see the entire time (that would be boring), but it would have been nice to get a few small moments highlighted. I also couldn’t help but have intense visions of the Fire Swamp from The Princess Bride when reading the parts taking place in The Death Swamp (just instead of ROUSs there are giant lizards). If you’ve never read or seen The Princess Bride, this won’t bug you! 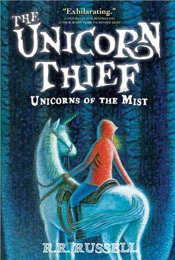 Despite these few quibbles, The Unicorn Thief and its series will definitely find a home in my classroom – I can see the students really enjoying it! e-ARC provided by Sourcebooks Jabberwocky through Netgalley in exchange for my honest review. Thank you! 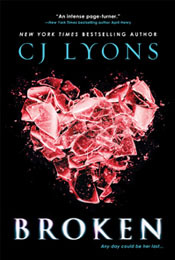 Broken by CJ Lyons is an intriguing medical mystery that you think is heading in one direction, and then completely changes trajectory – and that’s cool. Scarlet has a condition called Long QT Syndrome that means her heart could stop at any time. She gets three days to prove that she can handle high school (she wants to live a little after spending most of her life in hospitals and home) but what starts as a trial run to see if she can survive her condition, turns into a race to see if she can help herself and her new friends survive something much worse. Scarlet is a hard character to pin down. She’s spent her life listening to her mother about everything to do with nutrition, health and activities. So she’s fairly meek in some instances. But in others, Scarlet is defiant. She wants to be at school, to have friends and to live. In small ways, she is trying to break out from under her mother who she knows has good intentions, but is smothering her. With a father who is mostly absent due to work, Scarlet starts to find acceptance and companionship in her support group at the school. And the cute boy Tony in her biology class. The book is a decent size, with small chapters. The writing is very engaging and the pace keeps up well throughout the book. The mystery builds through Scarlet’s friends – finding out why they are in the support group, why her mother dislikes them, and what’s really in her medical records that she can’t see. In three days, Scarlet’s life is turned upside down – and it’s not because of her illness. Broken turned out to be so much more than I was expecting, and I really enjoyed it. As for the final mystery, the reveal and solution, I’m a little sceptical that no one uncovered anything over fifteen years worth of hospital visits and medical records and that a high school sophomore put all the clues together. Also that Scarlet takes very little time to come to terms with things (she does freak out a bit, but it goes very fast once we hit the end section of the book). But it works in this case, and didn’t detract from the story and plot. I would definitely read more from CJ Lyons. e-ARC received through Netgalley from Sourcebooks Fire. Thank you! Publication: June 2013 from Little, Brown & Co. Boy Nobody is the perennial new kid in school, the one few notice and nobody thinkgs much about. He shows up in a new high school, in a new town, under a new name, makes a few friends, and doesn’t stay long. Just long enough for someone in his new friend’s family to die – of “natural causes.”Mission accomplished, Boy Nobody disappears, moving on to the next target. But when he’s assigned to the mayor of New York City, things change. The daughter seems so much like him; the mayor reminds him of his father. And when memories and questions surface, his handlers at The Program are watching. Because somewhere, deep inside Boy Nobody, is somebody: the kid he once was; the teen who wants normal things, like a real home and parents; a young man who wants out. And who just might want those things badly enough to sabotage The Program’s mission. Boy Nobody by Allen Zadoff turned out to be something I was not expecting – in a pretty good way. A teen assassin, “Ben” through most of the book, is sent on yet another mission by his handlers at The Program, but this one is different. With a timeline of only five days to get close enough to the mayor of NYC in order to kill him, he has to act fast. But the daughter, Sam, complicates his mission. As well as some unexpected followers, most certainly enemies but who and why? I was unsure through most of the book how I felt about it, but the ending saved my opinion. It went in a direction I was not anticipating at all from the synopsis. It was awesome. So the book takes place over a very short time period – five or so days – in which Ben, our Boy Nobody, goes through a mini-crisis over his role in The Program and what happened to his life and his parents, and whether he wants to continue or go back to a normal life away from all things killing. Meeting Sam kind of starts pushing him in that direction, enough that he hesitates to complete his mission to kill her father. Ben is very cold and driven, since he’s been conditioned that way, but you get to see glimpses of the boy he must have been before The Program. Lets say that his morals start to shine through a little bit. While he manages to keep mostly on track for his mission (mostly), he does start to go beyond The Program’s back a little bit, firstly and mostly by enlisting the aid of a teen hacker. Ben’s starting to plan a way out, methinks. The action was swift and intense, and I loved the descriptions of NYC, especially places I knew. But even if you’ve never been, it is very descriptive and easy to paint a picture of places and events. Most of Boy Nobody is spent with Ben figuring out how to complete his mission, finding out who the people following him are, and quick flashbacks to a past that start to tell us why he may be having second thoughts about his “career choice” (as well as a visit from an…old friend). The book is like a quick snapshot into his life, and while there is a very fast romance start-up (two days?) it went in no direction I ever thought it would. The ending kind of comes out of left field (kind of) and is very awesome in the sense that it fits the feel and tone of the book and I am so glad it happened (but sad). I think anything different would have been disappointing, honestly. 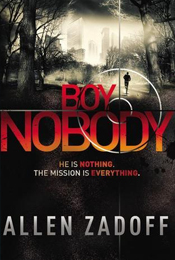 Boy Nobody by Allen Zadoff is a fairly quick, entertaining book that I think will definitely appeal to mystery and thriller readers, and anyone wanting to step into that genre. I’m interested for the sequel! ARC received from Hachette Book Group Canada in exchange for my honest review. Thank you! Rating: 3.5 ♥ / 5 ♥ – I liked it! Wonder Light: Unicorns of the Mist by R.R. Russell is the first book in an exciting new middle grade series. Discovering a ghostly boy who is all too real and brings unicorns in his wake at the school for troubled girls that Twig is sent to starts Twig on a path she never could have imagined. Despite being sent to a school on a pony ranch that has five other girls at it, this story is really all about Twig, Ben (the ghost boy) and Wonder Light, the unicorn that is born in front of Twig. We get to see a bit of the youngest girl, Casey, but barely anything of the others. I’m hoping we’ll get a bit more of them in the sequel(s). Over the course of the book, Twig goes from a near-silent, worried, upset and unsure twelve-year-old to a confident, happy and protective thirteen-year-old. Not to say she still doesn’t have worries and concerns about her life before coming to the Murley’s ranch/school/home, but she’s learning to accept and cope with those problems. Ben helps a lot in that, the mysterious boy who cares for the unicorns on the island and has his own mystery about him that I am crazy curious about. He’s patient with, and kind to, Twig – and the unicorns. He helps show her what she’s capable of when she begins to doubt herself. It is a bit curious that Twig is able to so easily sneak out of the house at night (for a year) without anyone taking much notice (especially after she did get caught once. You’d think that would make it harder in the future). I also found it strange that these girls are at the ranch for a year, with little mention of going home for visits or family coming to see them. The year does move very quickly in the smaller book (220ish pages) so I’m just assuming there are many moments we don’t get to see. The unicorn lore in the book is quite interesting and the dark, angry herd leader Dagger a stark contrast to the light and joyous Wonder Light – the unicorn that Twig raises from its birth. Unlike the pure and good unicorns you usually see in stories or mythology (though not all!) Dagger is vicious, attacking other unicorns, the horses and ponies at the ranch and even people. Twig, Ben, Wonder Light, Ben’s unicorn Indy and others are out to stop Dagger and help save the herd. Wonder Light: Unicorns of the Mist by R.R. Russell brought me back to childhood. I loved unicorns when I was younger, and this is a book that I would have happily devoured and re-read many times. R.R. Russell mixes the fantasy of the unicorns and a parallel world wonderfully with that of Twig’s new home on the ranch, and her journey to finding her own true self, and her courage. 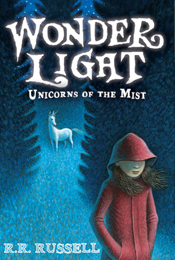 I can easily see this book, and series, being a popular one in grades three through six classrooms – with a relatable character, a good mystery and the fun fantasy elements, Wonder Light: Unicorns of the Mist will definitely keep you reading. e-ARC received from Sourcebooks Jabberwocky in exchange for my honest review. Thank you! Sourcebooks is offering one (1) copy of Wonder Light to one lucky reader! As if traveling to a new country in search of her missing mother weren’t difficult enough, Mira has to do it dressed as a boy. In a different century. A new postcard from her time-traveling mother points Mira to the 16th century Rome. But before she can rescue her mom, she must follow the clues left around the city to find Giordano Bruno, a famous thinker and mathematician, who discovered something so shocking that important Italian officials don’t want it revealed. All the while avoiding the Watchers – time-traveling police who want Mira back in her own time. It’s another whirlwind adventure for Mira, and this time she is determined to bring her mother out of the past. 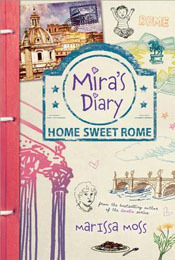 Mira’s Diary: Home Sweet Rome by Marissa Moss is book in a fun middle grade series about a girl who learns she can time travel and must help her mother who is stuck in the past trying to make right the future. I quite liked the first book, Lost in Paris, and fully enjoyed this one as well. Mira receives another note from her lost-in-time mother and she, her father and brother Malcolm are off to Rome. Mira’s not long in Rome before she time travels to the 16th century, meeting painters, cardinals and more (including the Watcher from the last book who is set to stop both Mira and her mother, and Morton, who helps Mira be where she needs to go). Despite the relatively short time between her first experiences with time travel in Paris and now, Mira seems more confident in herself to figure out what her mother wants her to do and try to succeed in that task. It’s a bit different this time, and will take the reader on an interesting ride. Mira’s father and Malcolm offer support (emotional and research) in her present when she travels back to them, and are very helpful and understanding. Mira is still a fun character, full of determination and strength that makes her suitable for the task of time traveling. She’s getting quicker at thinking on her feet, and isn’t getting too attached to the people she meets in the past. Like in the first book, the secondary characters are there more to highlight historical figures and provide Mira information and a mission to complete. In Home Sweet Rome she spend much of her time with a cardinal Del Monte, the painter Caravaggio and his servant Giovanni, and the man she’s meant to help, Giordano Bruno. The sketches scattered throughout the book are a wonderful addition to the story, and I continue to be inordinately pleased with the author’s note and bibliography Marissa Moss includes at the back of the book. Mira’s Diary: Home Sweet Rome is a quiet historical mystery that has the reader diving right in to old Rome and the Inquisition. I’m definitely still seeing this as a must-have series for the classroom, and could happily put it into the hands of young readers. Time travel, mystery and history? All three awesome things right there. e-ARC provided by Sourcebooks Jabberwocky and Netgalley in exchange for my honest review. Thank you! Timekeeper by Alexandra Monir begins right where Timeless left off and dives right into the mystery of how Philip is in the future. We also get the reasons why her grandparents seem mysterious and tumble head first down the rabbit hole with Michele’s father and find out why Michele can travel in time. I really enjoyed the background story we get in this book about the time traveling and the mysterious Time Society. Alexandra Monir has interspersed passages from the Timekeeper Handbook with the chapters, as well as entries from Irving’s (Michele’s father) journal. These passages add the background we need without having the characters talk it out in dialogue, which I liked. The villain of Timekeeper is Rebecca, a creepy character who comes from the past but has dire effects on Michele’s 21st century present. And while I did enjoy how diabolical Rebecca is as a character,I found her timeline confusing! I’ve so far been able to keep Michele’s, Philip’s and Irving’s timelines in order, hers I just found odd, and the ending scene when the same event seems to play out in multiple times really made me scratch my head for a moment. Michele definitely does a bit more growing up through this book, though the action is still so fast paced that I feel we really don’t get to see as much of her inner characters as I’d like. Philip’s presence in Michele’s original time is a great mystery to solve and I liked the explanation for it. Caissie, Michele’s friend, also has a bit of a bigger role to play this time around and lends a new facet to the whole Rebecca plot line and unwittingly manages to help Michele discover more about her father, her time traveling, and some answers to the big old “why me” and “what’s happening”. 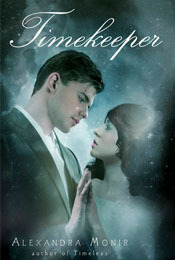 Timekeeper by Alexandra Monir is one of those sequels that really pick up from the first book and keep the ball rolling. Everything is changing for Michele, and not always for the better. There are hints of things to come that could be very bad, and I definitely don’t think we’ve seen the last of Rebecca. I’ll be interested to see where the series goes in relation to Michele’s time traveling and her relationship with Philip. And while I’m not a fan of the insta-love, at least Michele’s and Philip’s relationship has some obstacles to overcome in their course of true love. I’m looking forward to a book three. e-ARC provided by Authors on the Web through Netgalley in exchange for my honest review. Thank you!